The pieces in this music book are composed for Piano. This does not prevent from playing them on a free bass Bayan or Accordion. Material in the left hand "lays" in fingers so naturally as if these arrangements of Ukrainian folk songs were done for Bayan! Famous Ukrainian composer Volodymyr Stetsenko studied Bayan in class of legendary Mykola Rizol in Kyiv Academy of Music. This is why maybe composer while arranging songs for Piano was still thinking in a Bayan way! We advise these book for learners with slightly advanced skills. Several songs can be compiled in a suite up to your wish and played at exams, concerts or for self-pleasure. It is not easy to switch from one mood to another while playing short pieces in a sequence, to create corresponding spirit of the music. This is why we think this book is so precious in the process of learning Bayan. The arrangements are rather short. Where it is appropriate you can repeat the piece or a part of it. You can also train your reading-on-spot skills playing songs from the score. 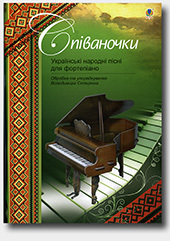 Each song contains lyrics (in Ukrainian). This can be usefull for Ukrainian speaking public.